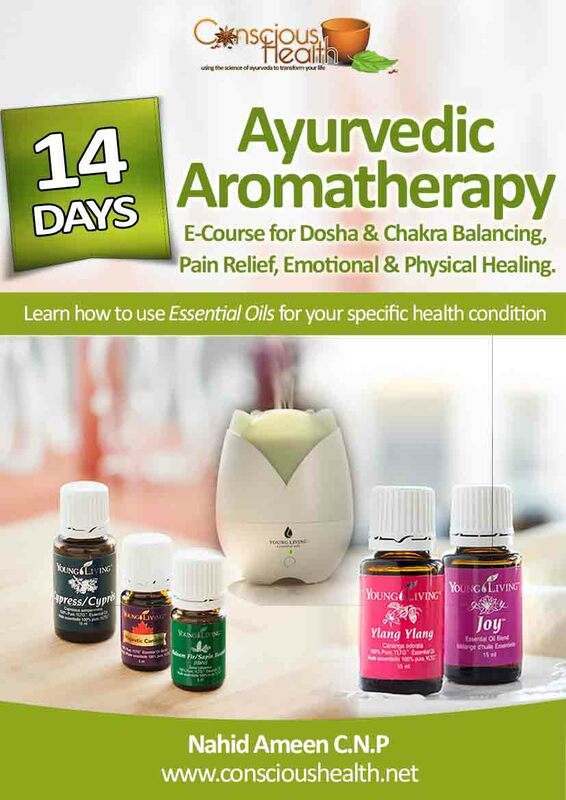 The 14-Day Ayurvedic Aromatherapy or Essential Oil Basic is an e-course that teaches you how to apply essential oils in manner that follows Ayurvedic principles. The course focuses on body type or Dosha imbalances and how essential oils can bring the Dosha’s back in to balance. I share with you how to identify the perfect oils for your health condition. Learn various ways to use essential oils safely, for self-healing, pain relief, emotional release, reduce stress and anxiety as well as making your own DIY home cleaners and natural cosmetic products. Essential oils can be fast and effective for any chronic health condition such as asthma, allergies, acne, hair loss, cold and flu, joint pain, insomnia, blood pressure, diabetes and more. Enroll now for the e-course and join me while I take you on to a healing adventure with essential oils. Read by blog to learn where to get therapeutic grade essential oils for safe use. Essential oils are liquids derived from leaves, stems, flowers, bark, roots or other elements of a plant by distilling the plant material by steam or water. They contain the true essential of the plant. Pure EO’s are extremely concentrated – even drop goes a long way. They are NOT similar to fragrance oils or perfumes. Introducing essential oils is considered a lifestyle change. Essential oils can be used to prevent, maintain and heal emotional and physical disturbances as well as pain relief. They are used to increase your immunity and uplift your mood. Inhale, massage or use essentials in day to day activities. Why is this c-Course Unique? This e-Course integrates Ayurvedic philosophy throughout, providing a structure to understand essential oils, holistic healing and self. You will learn how to apply essential oils in a manner consistent with Ayurvedic healing. We talk about how to find and use rare (100% pure) Ayurvedic oils. Oils that protect the immune system, improve mood and reduce stress/anxiety. Oils according to your Ayurvedic body type. Oils that assists in First Aid, sooth headaches and relief pain. Reduce impurities present in the air. Replace chemical cleaning products in your home. How, where and when to use these precious oils.